Lake houses in and around Lake Livingston are ridiculously cheap right now. The lake was built in 1969 and has been through several boom and bust cycles, just like Houston, the big city that is one hour from the lake. Weekend homes are a luxury that is the first to go in hard times. We bought Star Hill six years ago and got a great deal. Our monthly payment on a 15 year loan is less than a car note. The neighborhood we live in has a gated boat launch, a pool and takes care of all the neighborhood mowing for $125 per homeowner per year. All that said, I was still VERY nervous when we bought the house. I tend to be a super worrywart when it comes to money. 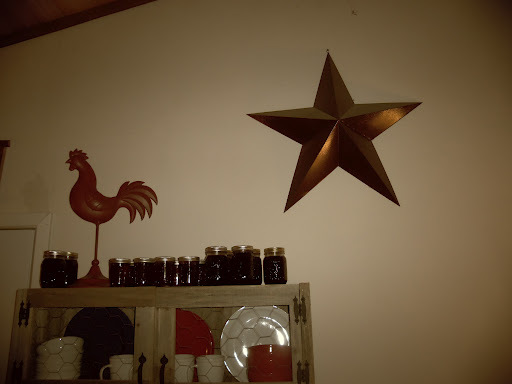 I decided when we bought the place that we could not spend a fortune getting the house set up, but at the same time, I wanted it to be a place I wouldn’t be embarrassed to bring someone to. 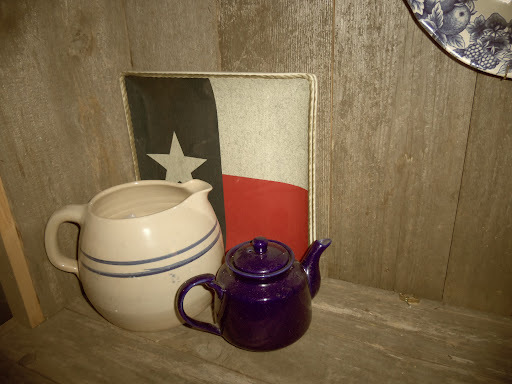 I wanted the house to have a warm homey feeling and my sense of style. 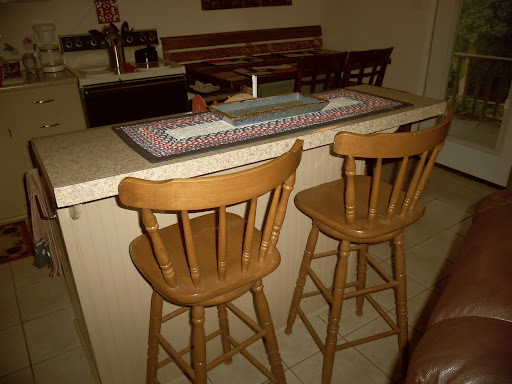 I set a budge of $1000 to furnish the house when we bought the place. 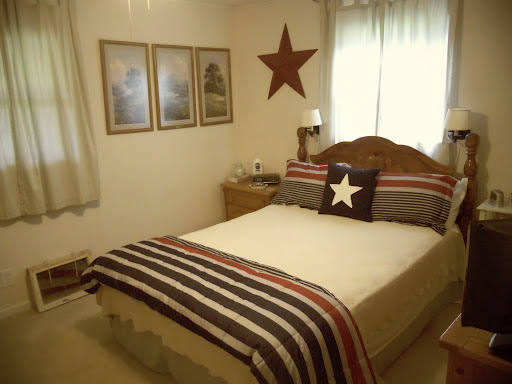 I wanted to have it fully furnished by the first summer and ready for guests. We started going to garage sales in the city where we lived as soon as we put money down on the house. Here is the result and the tally. No, this television did not make an appearance until last year. 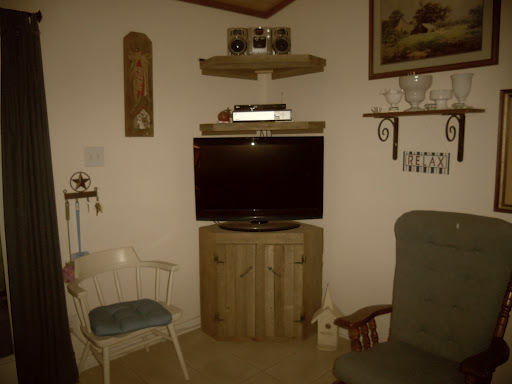 We moved a big hunkin tv here from our house that was not being used and we had a dvd player- no live television back then. 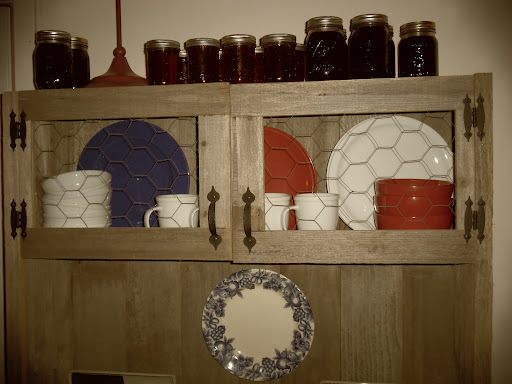 The corner cabinet was garage sale purchase. $15.00. 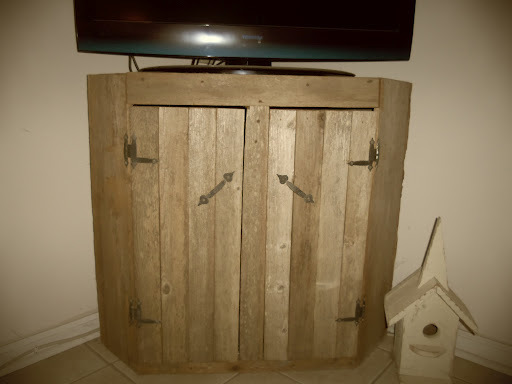 We loved it because it matched the furniture that Hubby made years ago for our house out of fencing that we salvaged. Hubby added the shelves above the corner cabinet from old fencing too. The white chair came from a garage sale for $2.00. 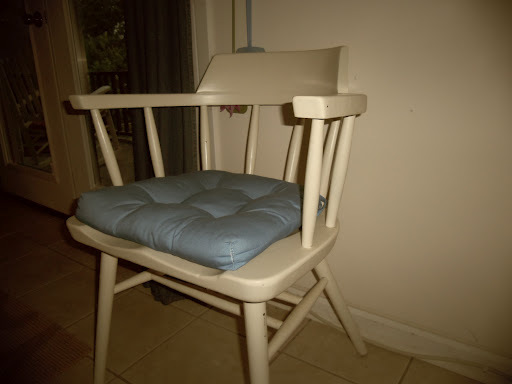 The rocker was ours and it was already a blue denim color! The key hooks were a gift, the shelves on the wall were garage sale finds. We use the storage under the television for dvd’s, toys, and electronics. 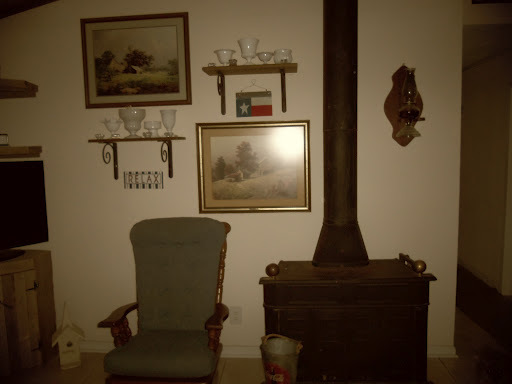 We were so lucky that the place had this awesome wood burning stove. It makes it so comfy in the winter. One of the three big ticket items that we bought was the couch. The mattresses for the two queen beds and the couch together were $725.00. We bought this brand new, great leather sleeper sofa at an auction on a cold rainy day for $225. No one bid against us. 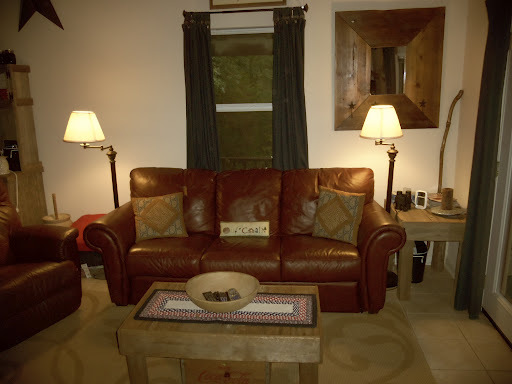 The end tables and coffee table were made by Hubby when the kids were little. 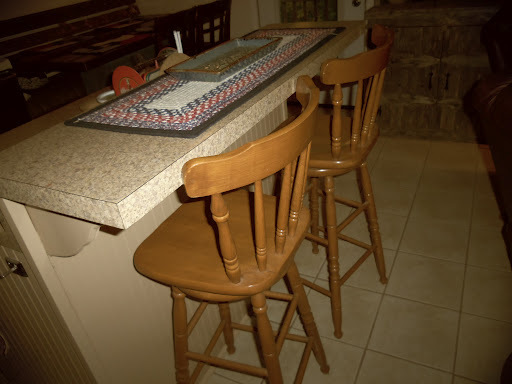 They were tough enough to be used rough for years so we knew they would hold up well at the lake. The bowl was my great grandmother’s bread bowl. We found the floor lamps on clearance at Lowe’s for $12.00 each one Saturday morning. They are really too fancy, but we are glad to have lights that can be moved around as needed. 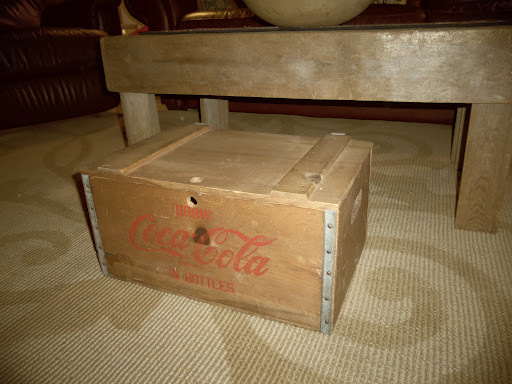 The Coke box under the coffee table holds games. The box was a gift. The mirror was a recent addition. 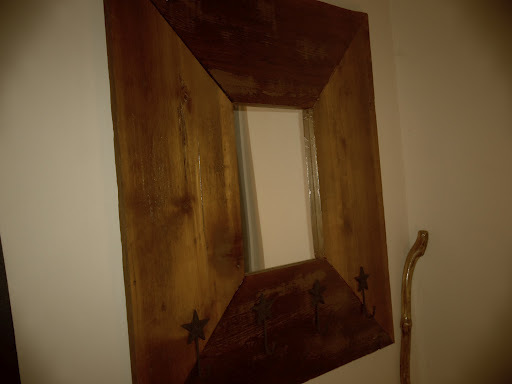 Of course we made it from our recycled wood. The varnished walking stick was a gift. 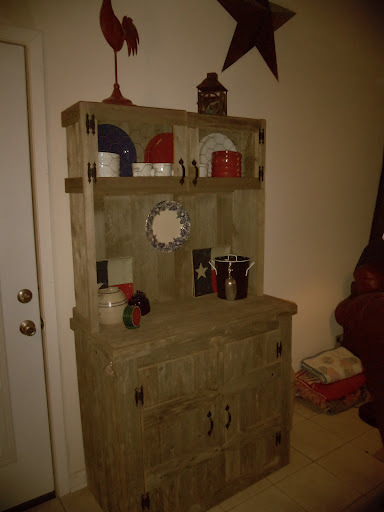 The buffet is my favorite piece that Hubby built for the house. I drew it , he took what I wanted and ran with it. Everything was made from scraps or stuff being thrown away. The chicken wire even came out of one of my neighbor’s trash. I love how he took the tip of some pickets and matched them up on the door. No cost. My Star. I did pay $10.00 for this. 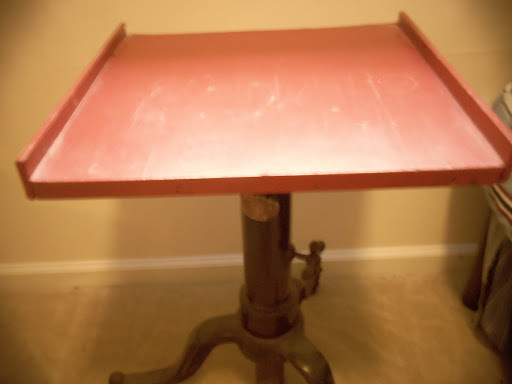 Hubby drove by a garage sale on the way to work one Friday morning for $5.00. Not bad for $2.50 per chair. 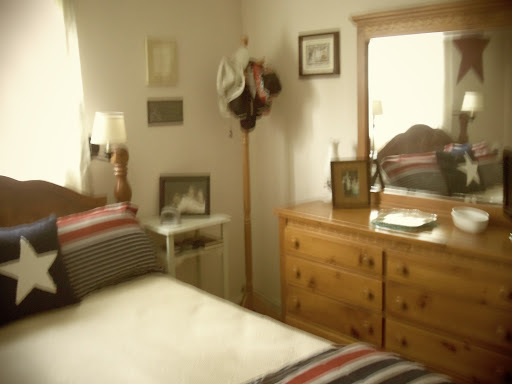 We were so fortunate to get our bedroom furniture. 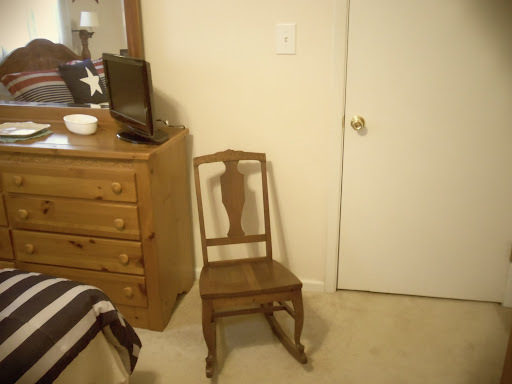 A neighbor was moving and did not want the furniture from their daughter’s room. 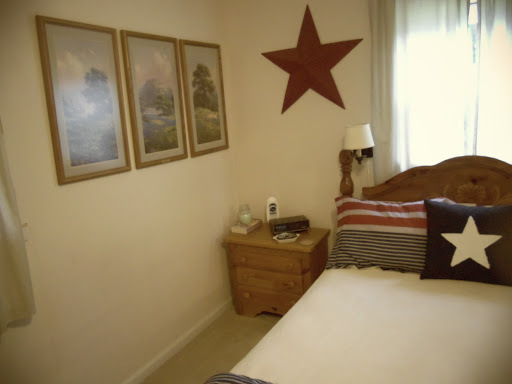 Except for the headboard that we bought at the Star Clearance Outlet for $45.00 ( big mistake, we paid way too much) the rest of the furniture was free. 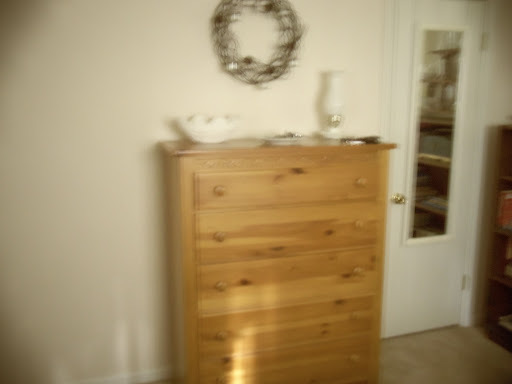 The dresser, night stand and chest were from the neighbor. 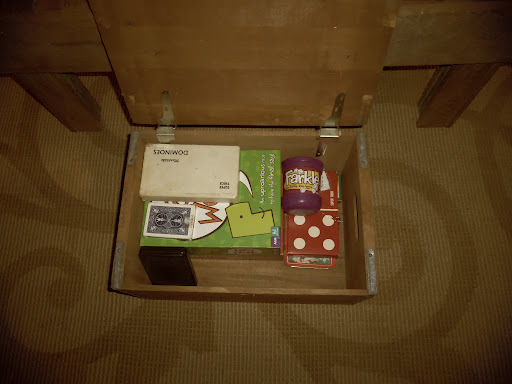 The other nightstand my mom found for me when a friend of hers was getting rid of it. The hat rack was from my mom. 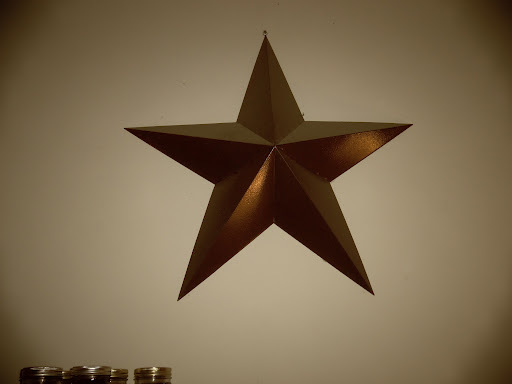 I bought the star in this room several years after we moved in. The bookcase was in my dad’s office. 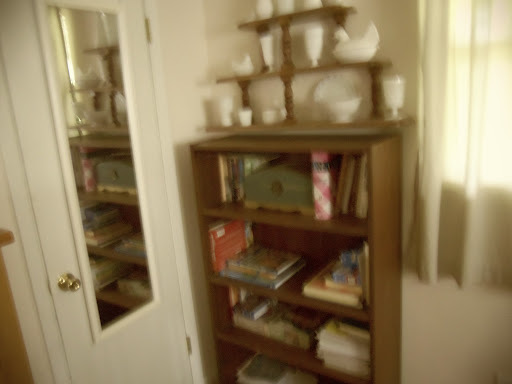 The shelf above the bookcase was the first furniture piece Hubby made for me when we married, probably 28 years ago. 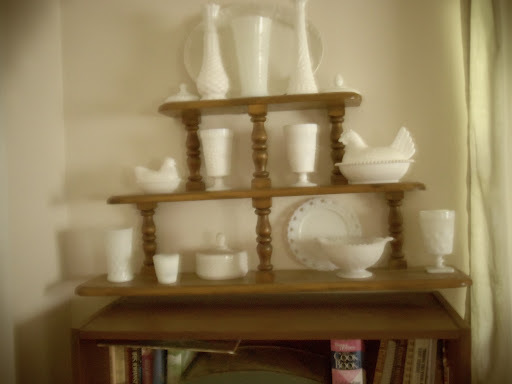 I have collected milk glass since we moved in. I find it cheap and keep adding. This rocker was added this past year. 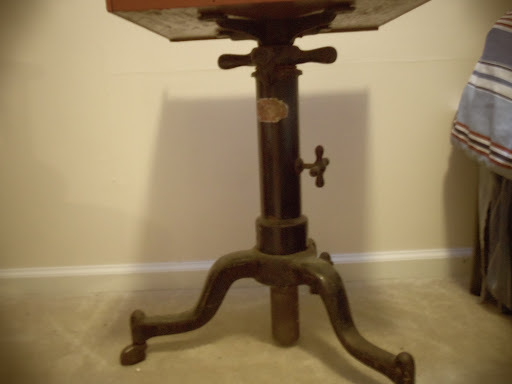 I bought it at an antique shop. I love it. 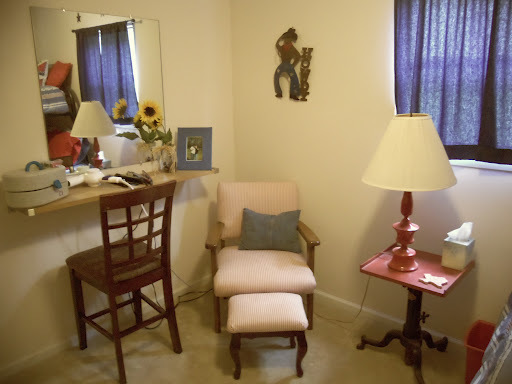 The back bedroom- the kids call the cave room because it is so dark at night, was furnished with a recovered chair that was my grandmother’s, a shelf and a bunk bed. The only thing we bought was the bunk. When we bought the bunk bed, the mattress on top was still wrapped in plastic so we kept it. The bottom mattress came from my brother and sister in law’s house. The bedding came from Big Lots. The shelf came from Baby Boy’s bedroom. The mirror is from when changed out our bathroom mirror. 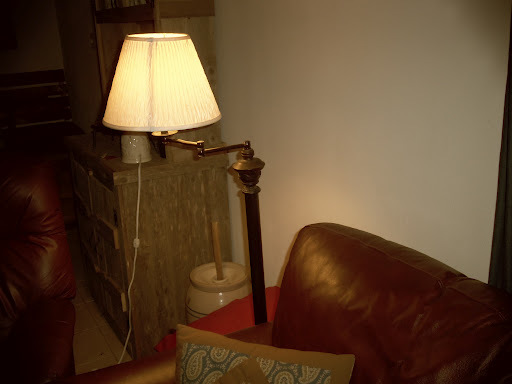 The lamp is a hand me down. The typing table was left in our city house when we moved in. Baby boy and Sweet Amanda were in the front room this weekend so I did not get to photograph this room. 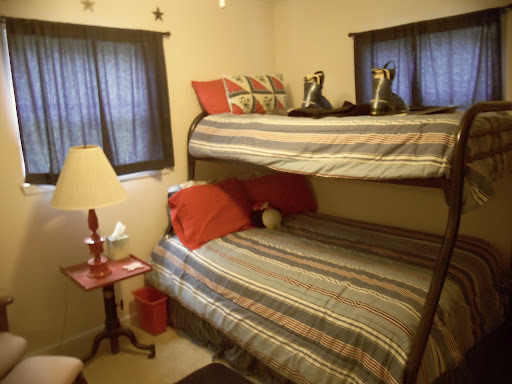 The bed we bought for $250.00 along with the one in our room. 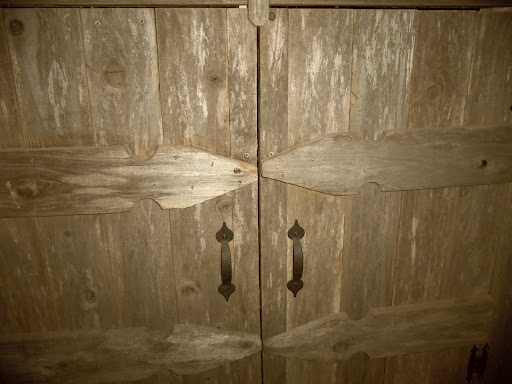 There is a cedar cabinet that was in our attic in the city house and two night tables that were free. The lamp was given to me when my boss retired. We have added two recliners- one of them bought new- and some other items along the way but we were able to get a good start on our weekend home under $1000.00. Tell your family and friends you will take stuff they don’t want. Figure out what you really need- beds, chairs, couches, tables. Take stuff even if you don’t love it. You are not married to it and you can replace it as you find better. Make what you can. That saves us a fortune. Craigslist is a great resource. Shop around for the new stuff. Even at department stores sometimes they will make a deal on floor models, and clearance items. Don’t jump at the first thing you find.